Come and discover with Homeopharma Madagascar's biodiversity, the country's wealth of endemic flora with its aromatic and medicinal plants of an estimated 12,000 species. This is surely one of the richest and most diverse flora in the world. Indeed, Madagascar offers a wide diversity of all life forms: micro-organisms, plants and animals. 12,000 plant species, 3% of those on the entire planet, thrive on the island of Madagascar, also known as the forgotten continent! Many are endemic. They exist only in Madagascar. Over centuries, Malagasy people have studied this plant richness and gained knowledge of the active agents of countless medicinal plants and how to extract their hidden wealth, sometimes with miraculous powers: the essential oils. Homeopharma is a pharmaceutical establishment approved by the Ministry of Health that is specialised in herbal medicine, aromatherapy, renewal of traditional medicine and homeopathy. Located in Antananarivo, its founder Jean Claude Ratsimivony is a symbolic figure of the Big Island known for his long-standing commitment to innovation in the field of wellness and health. The new CEO since 2017, Feride Ismael, manages the organisation according to its founding principles. Homeopharma employs 490 workers and uses over 1,500 plants in the production of its natural products. Homeopharma manages the complete production process from planting to finished products. 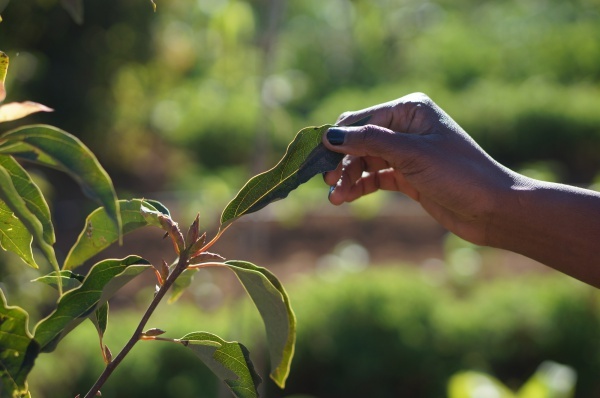 Over many parts of the island, Homeopharma plants, picks and harvests in total 600 hectares of forest, supervises and motivates farmers in the protection and renewal of plant resources, thus helping preserve the environment and biodiversity of Madagascar. 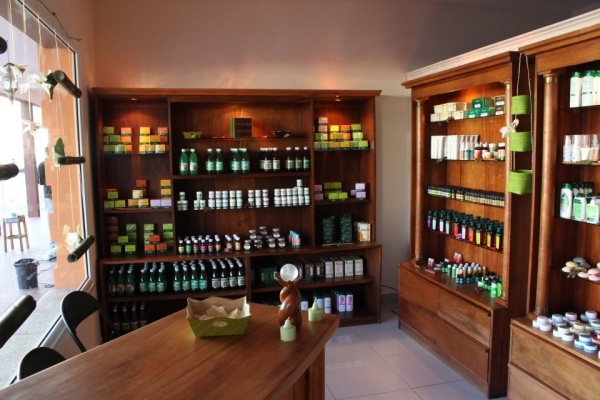 In Madagascar, Homeopharma's presence include a total of 40 institutes where the final products are offered at modest prices, so as to allow all Malagasy people to benefit from the preventive and curative properties of their products. These institutes also offer care and free advice. 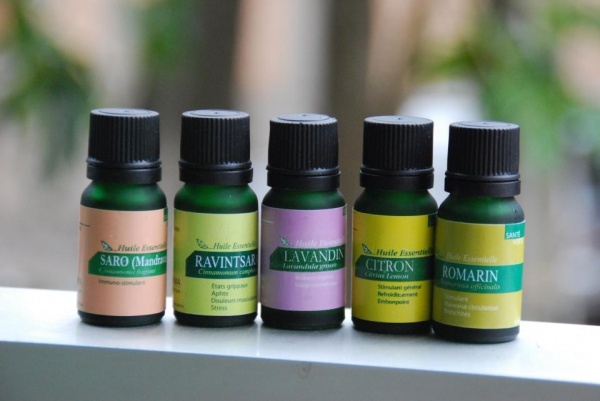 They practise relaxing or slimming massages with essential oils, amongst them the best in the world such as ravintsara or katrafay, all resulting from aromatic plants. A massage of not longer than 20 minutes is the time needed for a quality essential oil to be traced back to the taste buds of the tongue when applied to the soles of the feet. Thanks to its extraordinary power of penetration, it quickly breaks through the skin to reach the bloodstream and with it back to the tongue, as it could reach any other organ that we would aim for, before being totally dissolved in the body. A true miracle! In its distillery centres Homeopharma extracts the essential substances of many plants: their aromas. Once collected in flasks, the natural concentrate may heal those who suffer from ailments, such as stress, warts, insomnia, the affection of sinus, ears or larynx, rheumatism, flu symptoms, impotence, stomach pain. But what exactly is an essential oil? It can be defined as a powerful aromatic substance of complex composition, which includes volatile and odorous elements contained in plants. These are the elements that can help cure many diseases. How do you get this aromatic substance? In most cases by steam distillation at low temperature and low pressure. This technique allows to extract most of the active substances from the plant. Before distillation they are called essence. After it is called essential oil. Only 10% of plants produce an essence. And when this is the case, although the essence can be found throughout the plant, it is mainly concentrated in a single organ, such as root, rhizome, wood, bark, leaf, stem, flower, seed or fruit. These are the organs from which essential oil is obtained. 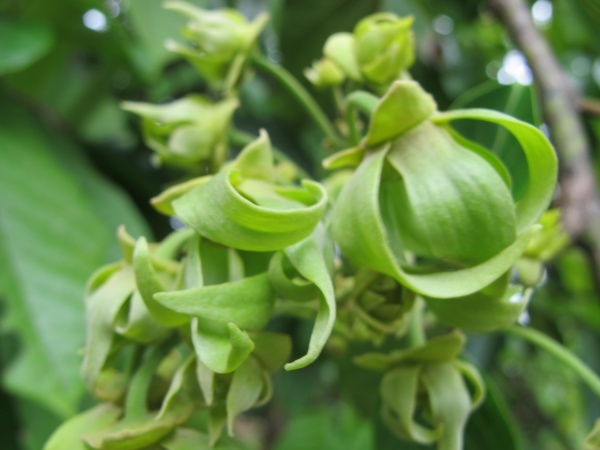 Distilled are ylang-ylang flowers, cinnamon bark, niaouli leaves or vetiver roots. Please note, the composition of the essence of a plant differs slightly from that of the essential oil of the same plant, because the distillation process cannot entirely extract the properties within the plant. The essential oil of mint is easier to extract because of the leaves. A slightly irregular low heat is enough. But a bit stronger heat is needed to break down the structure of a bark and to release its larger aromatic molecules. Citrus essential oil (orange, bergamot, lemon, mandarin) is obtained by squeezing the exocarp, the outer skin of the fruits, at room temperature. Throughout the entire production of essential oils, Madagascar ranks at the top. Firstly, due to the rarity of certain plants. Katrafay, extraordinary analgesic (pain-relieving), grows only on the Big Island. The quality of plants is important too. A ravintsara from India holds less active ingredients than a ravintsara from Madagascar. Another advantage is the environment. "The exceptionally rich and diverse terroirs of this island do not face pollution as in industrialised countries", remarked a french manufacturer, who use Malagasy essential oils in his products in Europe. And producers do not use chemical fertilisers either. These factors ensure the properties of plants to be 100% natural. The cultivation of plants in Madagascar cannot be compared with many other countries. Whilst elsewhere trees of a single species are aligned in a field, in Madagascar a wild environment is kept where ravintsara grows next to Eucalyptus globulus but also next to plants and non-aromatic trees. This wild environment ensures the quality of the soil. The essential oils of Homeopharma are tested and guaranteed in their laboratory to be of the highest quality. Without the wild environment, the synergy between species would be lost. Plants need to breathe and sense. We must listen to Jean Claude, depository of remedies collected by his grandfather from traditional healers, who will tell you about the plants, their sensitivity, their stress before a cyclone. Resting time, which allows the plants to regenerate between pickings, is also respected and can reach up to four years depending on the species! Harvesting of plant organs is done in jute or cotton bags to prevent maceration. Partial drying is necessary in case of rain in order to reduce the amount of water contained in the plant. And if so, only one type of plant will be dried at the time to avoid contamination and ensure the right balance of chemical properties. In short, the plants are treated for the treasures they are. And it doesn't stop there! Distillation over a wood fire, most of the time, is another added value to the Malagasy essential oils. In other countries it is done with regular gas heat. But firewood allows a variation of temperature which leads to a more complete extraction. The large molecules of the plants do not extract at a constant temperature if using gas. To be convinced of the importance of this, one needs only to observe the technicians at the Homeopharma distillery in Amparihy, Vontovorona. Their work procedure involves adding a piece of wood to light the fire and thereafter removing it to reach the desired temperature, causing a gradual temperature change. And there is minimum waste, although essential oils are a luxury item which normally require a lot of raw material. For example, 390 kilos of niaouli flowers give only 2.2 liters of oil! The central highlands - a mosaic of mountains, basins, plains and hills, provide thyme, eucalyptus, cypress, helichrysum, geranium, lemongrass, basil, citriodora and ravintsara. The east of the country - an area regularly flooded due to trade winds bringing rainfall, provides cloves, pepper, cinnamon, lantana, niaouli, vetiver, ginger, lemongrass and pink pepper. The drier west to the south - provides combava, lemon, cinnamon, mandravasarotra and sandalwood. The north, on the side of Antsiranana and the Amber Mountain - an area full of fragrant plants such as ylang-ylang, patchouli, geranium, basil and green pepper. This abundance becomes even more valuable given the choice between unitary oils and complex oils, or mixtures of unitary oils. These mixtures of unitary oils further strengthens the properties of each of them. Warning: never mix more than four oils because beyond that they neutralise each other. Madagascar is a treasure trove for essential oils and this is also true outside of the actual production. Everything done here contributes towards the development of improved traditional remedies, also referred to as "RTA". Firstly, because the cultivation of plants needed for essential oils is part of the reforestation of the Malagasy forest. Apart from the reforestation, have a look at the fragrant plants. The Malagasy reservoir of fragrant plants is so vast that we do not yet know all the species, nor therefore all the benefits we can derive from them. This is an area open for research, national and international, to further explore and protect. Furthermore, these oils support another part of the Malagasy culture: massages. At a time when it has become fashionable to have all kinds of exotic body therapies, the Malagasy offer the classic massage, a palpating and rolling massage, energetic and gentle, whose effects are increased by massage oils consisting of up to 10% essential oils. It goes without saying that this palpate and roll massage will be more beneficial than simply an exchange between the person being massaged and the masseur who will be rich. Giving a massage is art. Also receiving. This is often forgotten. What do the hands which treat you with essential oils have to give? The art of Malagasy living! This way of life with calm and serenity is called mora mora. And without forgetting the smile of the people here, this is a primary source of wellness in Madagascar. There are about 40 Homeopharma institutes located throughout Madagascar. For those travelling around the country, ask for a Homeopharma institute near your hotel. There is even a Homeopharma shop at Ivato International Airport giving travellers a first and last opportunity to stock up Homeopharma's products. Most of the institutes around the country offer massages with essential oils and at reasonable prices, allowing you to relax while enjoying nature's benefits. This page was last modified on 20 August 2018, at 05:58.